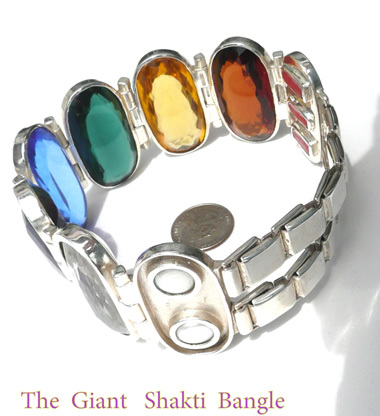 We are pleased to announce our Navaratnas are now also available in India. For more details, please contact us. 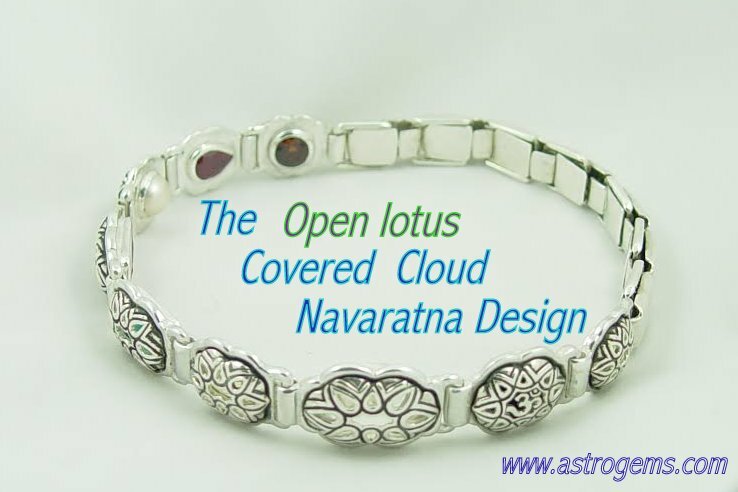 The Cloud Design, worn mostly by women, has a narrower spring band. 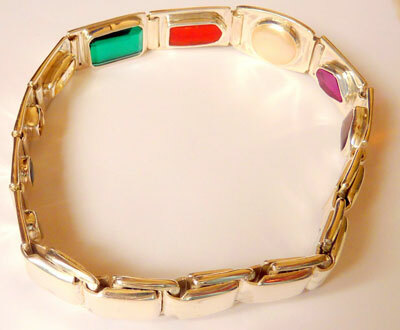 Because of difficulty in setting gems in these blanks, the setting charge is $15 more than the Standard Design. 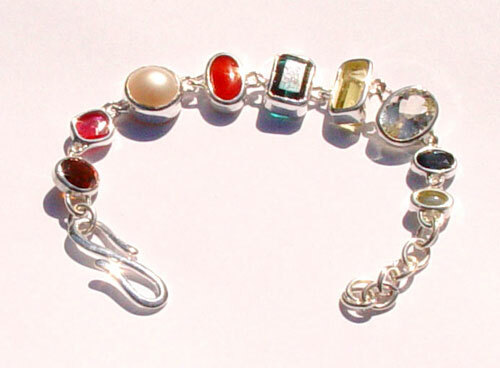 There are sometimes constraints in gem size due to the narrower links. 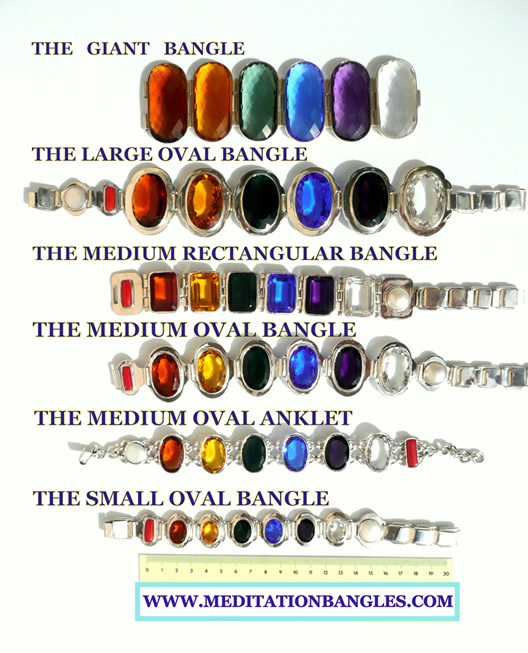 One may not notice looking at this picture, that each blank is a slightly different size, so that the gems will fit aesthetically. 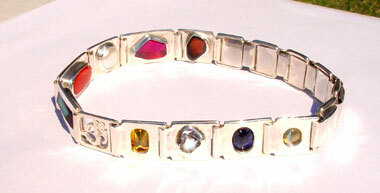 We have nine different sized links for various gem sizes. 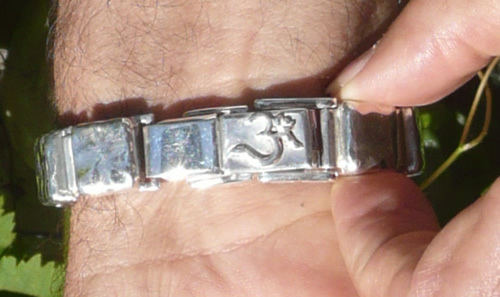 The spring link is 1/2 an inch in width. This is our most popular design. For the first few years, it was the only design we offered, but then some of our female clients asked us to come up with a more slender, artistic looking design. 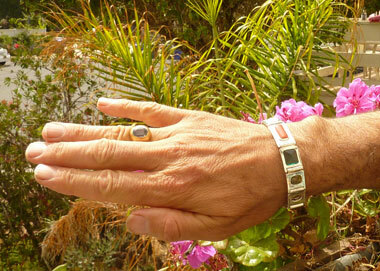 As with all of our Ayurvedic Jewelry, the gems are set so that they touch the skin. 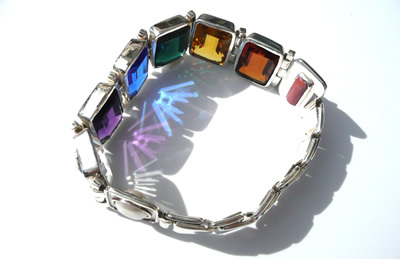 The bangle can also be worn as a bracelet when using only seven gems. 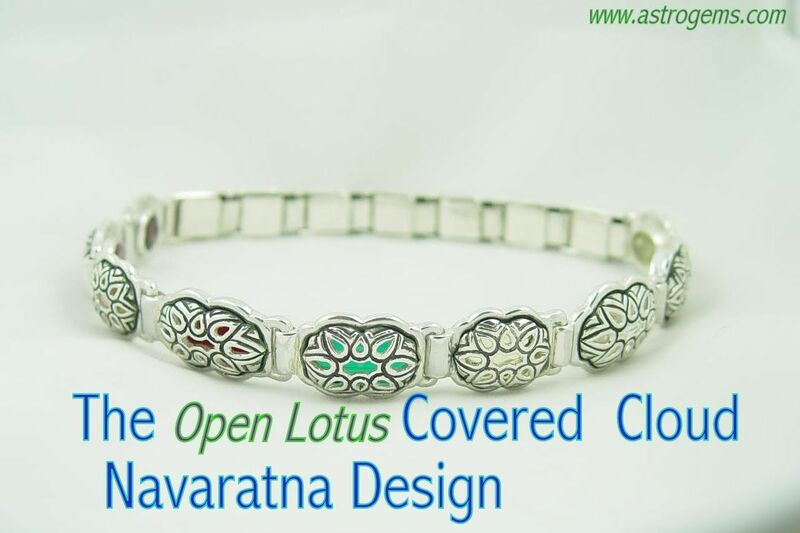 The design incorporates saving expense on the 22kt gold by having the gems set in solid silver blanks before the gold chakra cover is soldered into position. 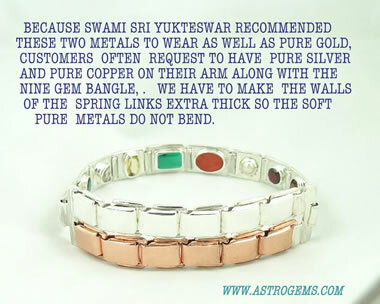 Each link represents the chakra for that particular gem and they are placed in their natural order. 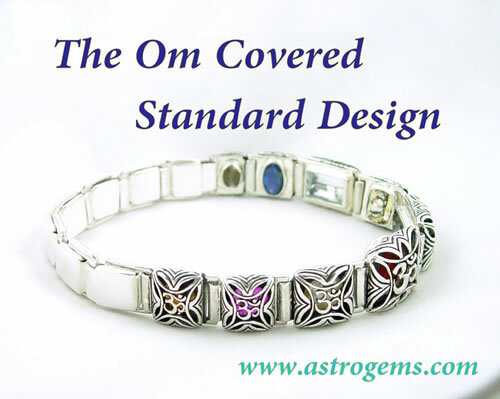 The design is unique to Ayurvedic Astrological Jewelry and has taken a long time to develop. 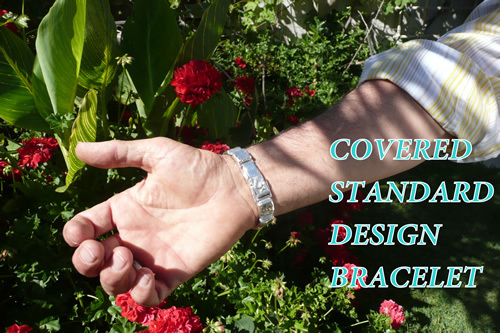 It is designed to be ergonomically comfortable and built to withstand a lifetime of normal wear and tear! 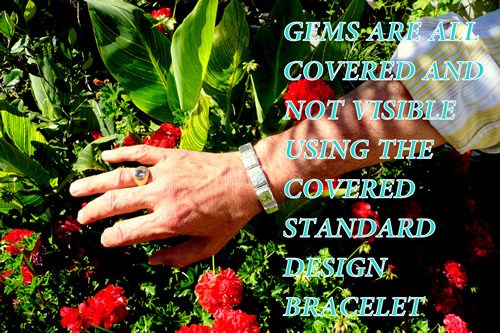 Some clients are very particular about the cosmetic appeal of jewelry and thus this design may cater to them. 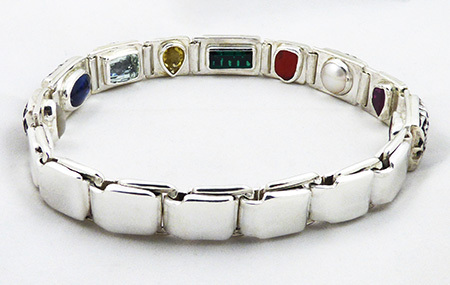 However from a perspective of potency I am afraid this design is unable to accommodate some of the larger stones due to the proportions of the setting blanks.We only commission this design for clients who purchase seven or nine gems. All the work is done at our office workshop. 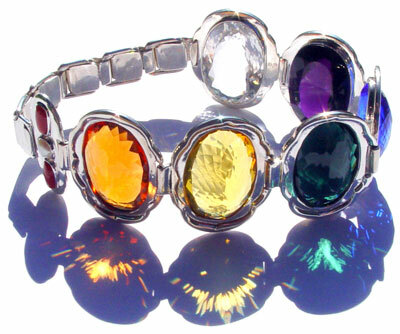 It generally takes about three weeks from purchase of the gems to receive the completed piece. 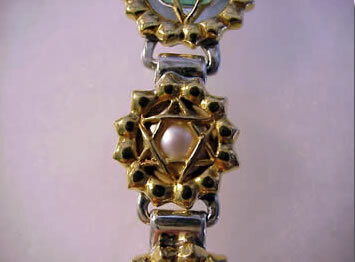 A close up of the pearl seated under the Anahata Chakra. 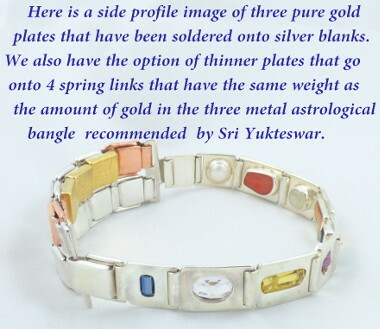 Pictured here from right to left are the gold overplates patterned after the symbols for the Sahasrara,Ajna, Vishuddi, Anahata,Manipura,Svadisthanaand Muladhara chakras. 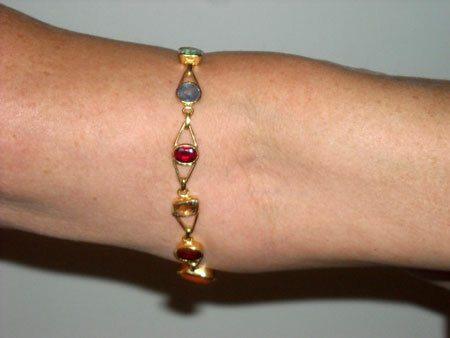 This bracelet , anklet or upper arm bangle is called this because the gold around the gem is all thickened bezel and the extender arms are V shaped . The sideways V extenders are shortened or lengthened depending on the length and design requested. 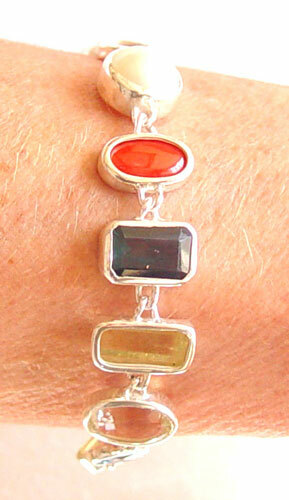 Can be custom sized with spring links or made with an S bend clasp on large gold or silver chain links. 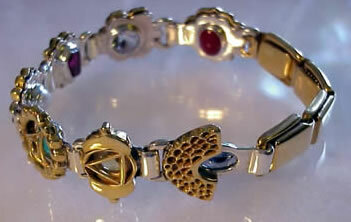 This design can be made in Silver or 14 carat gold. With the more delicate designs like the Bezel V it is recommended to use 14 karat gold for long term durability. 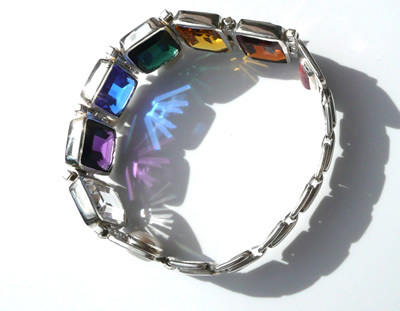 Bezel set anklet or upper arm design bangle.Because the gems are bezel set in a length wise position this design is too long for the radius of the wrist and can not be worn as a bracelet. 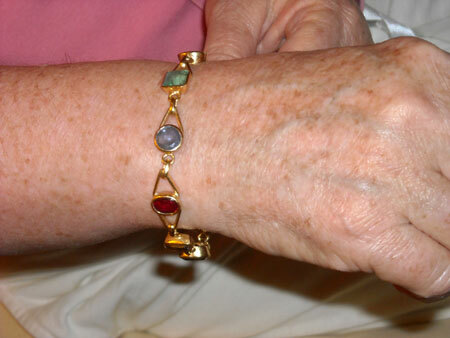 As the radius of many ladies wrists are often less than 7 inches . 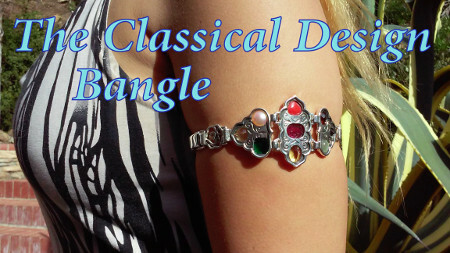 And so it can only be an anklet or made to fit just above the elbow. This is because such a design is always over 8 inches long. 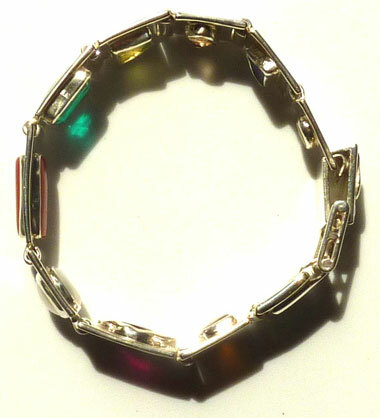 This is the top view of the Bezel Anklet or Above Elbow Arm Bangle. 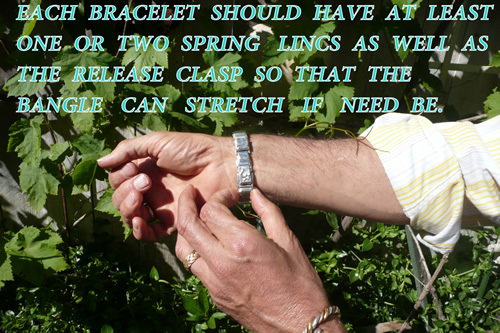 It has no spring links to keep it in position on the arm so it can only be worn above the elbow or on the ankle. 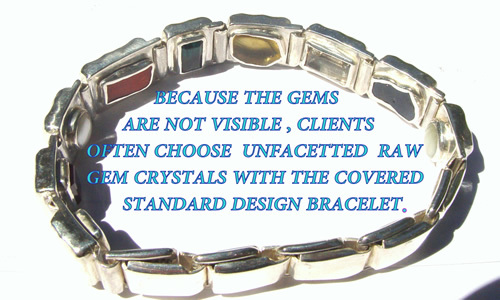 This similar design can be made to fit on the wrist, if the client chooses to use smaller stones or use less planetary gems. 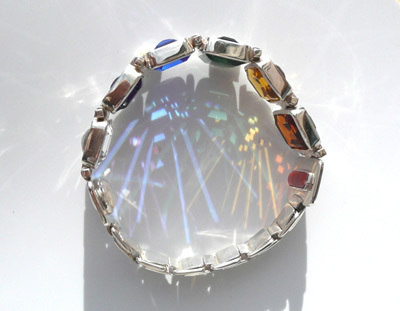 This is the underside of the Bezel Anklet or Above The Elbow Bangle design. 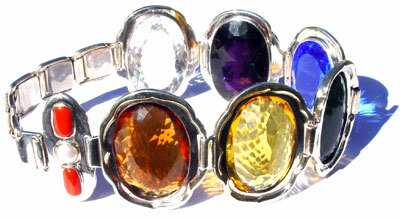 One can observe how the gems are fully open in the back and easily able to have extensive skin contact. 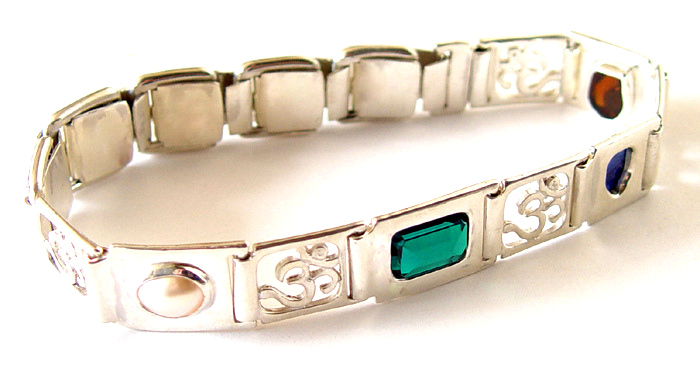 Another close up view of the Bezel Anklet or Above Elbow Bangle design. 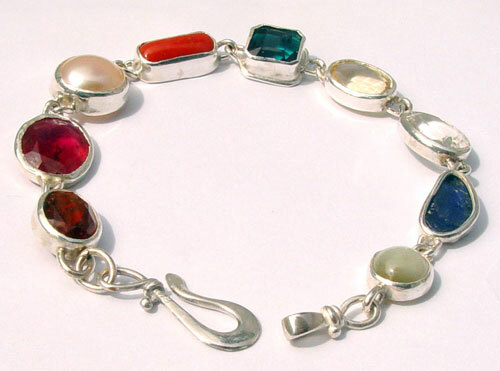 When the gemstones are set in a way with the width of the gemstone going along the length of the arm then it can be made short enough to fit as a wrist bracelet. The distance from end to end is much less and can accommodate a 6 inch wrist. 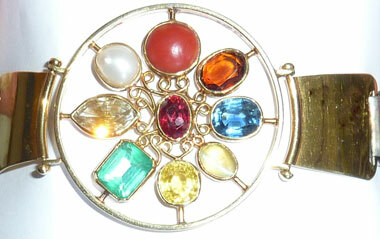 THE CONSTELLATION NAVARATNA DESIGN IS A TRADITIONAL ANCIENT DESIGN. 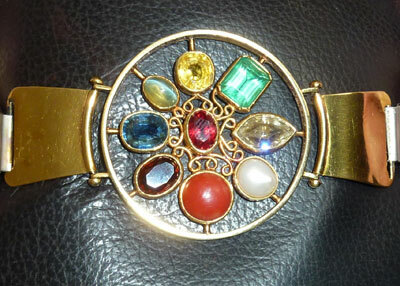 THE RUBY REPRESENTING THE SUN IS IN THE MIDDLE WITH ALL THE OTHER PLANETARY GEMS AROUND IT. 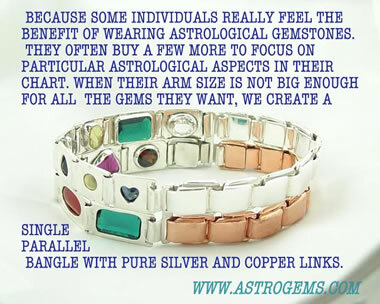 EACH CONSTELLATION DESIGN IS A LITTLE DIFFERENT DEPENDING ON THE SHAPES AND SIZE OF THE GEMSTONES. of classical Italian art. 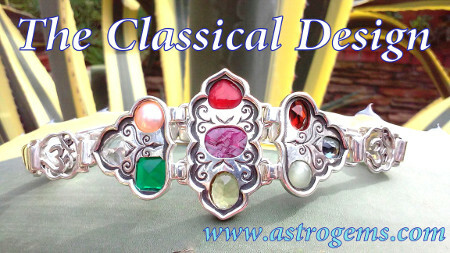 The appearance of the Classical Design may differ slightly depending on the gemstones you select. Contact us if you would like to create a custom design. 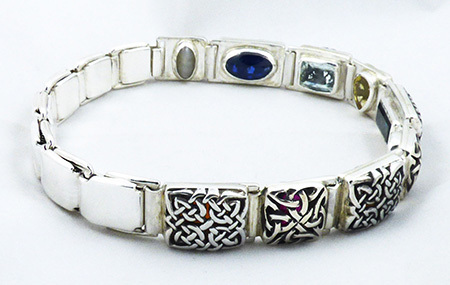 The Celtic Design can be made as either a bracelet or bangle. 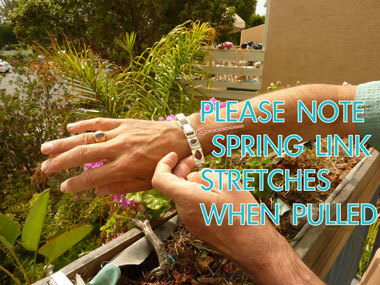 Most of our bangle designs use these expandable spring links to ensure comfort. 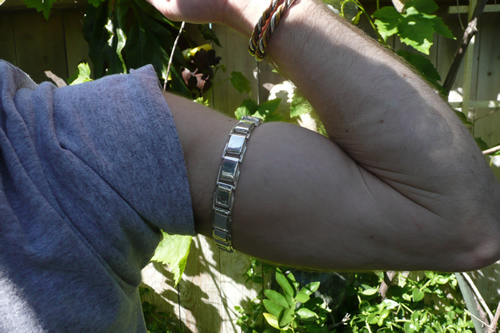 As you can see from the two photos above, the spring loaded links expand so that when you flex your arm, the bangle expands with it. 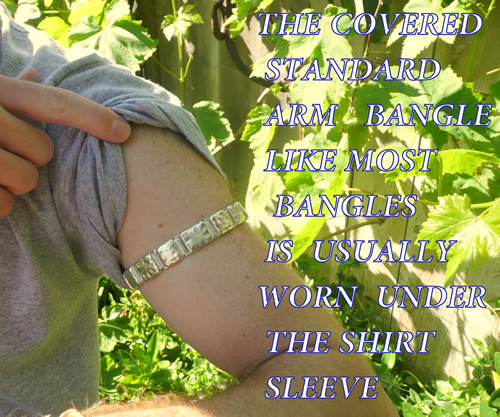 Wearing the bangle just above the biceps is comfortable, convenient, and promotes the bangles' function. My brother Roger's standard design in gold. After many years of use, still as comfy as ever. 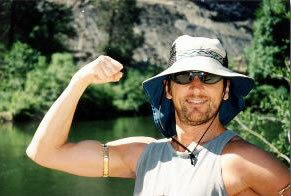 Please notice how the bangle is best situated between the biceps and deltoid. 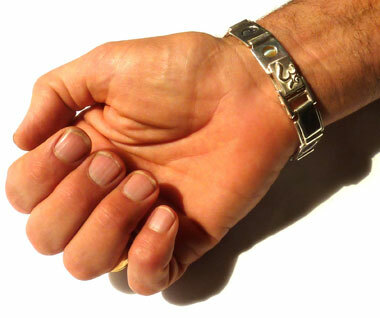 The Bangle Expands When Your Arm Flexes. This video gives a detailed explanation on why purchasing gems for Navaratna is a very tricky process in a world of enhanced gemstones. 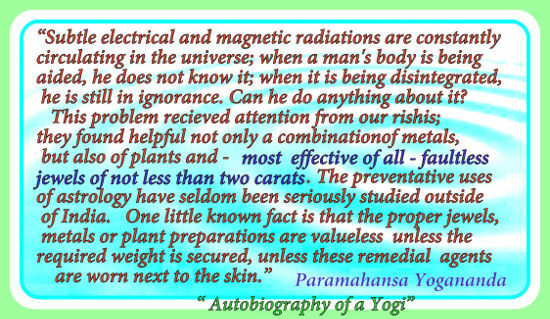 I briefly discusses some of the many pitfalls the uneducated buyer is very likely to experience. 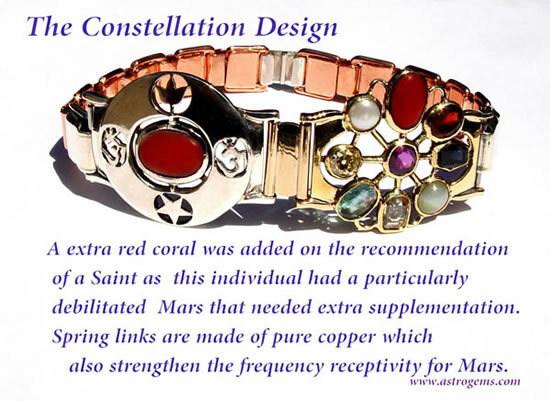 By using an example of a broken and poorly made bangle that came to astrogems to be re-built and changed into an effective bangle.. Nick goes through gem by gem explaining the mistakes his well intentioned client made.